Who will rule the south seas. 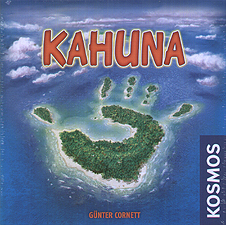 Two Kahuna - ancient sorcerers of the Pacific - compete for dominance on an archipelago consisting of twelve small islands. Using their magic and wisdom, they struggle for control of the islands. They anxiously await the cards handed to them by fate. But when the time is right, they move to capture one, two, or even more islands, trying to gain the upper hand. At the mercy of the magical powers of the South Seas, they quickly realize that even the best magic is no good without strategy. Reading the review from Wizball, I would have to agree - once you take control of the key areas, victory is a certainty. However, as palletranger has yet to figure this out for himself and am a BIG fan of winning, this is one we continue to play. . . . and I continue to win hands down. When this first came out I loved it, but as time went by I found that how the board was laid out if you managed to get control of a certain part of the board and maintain that control it was much easier to win. Does this make this a bad game? I do not think so but it does take it from being a great game to an average one in my opinion. Would I still recommend this game? I would have to say yes as it still makes a interesting tactical game. Though I would have to say that there are better two player games out there.